The New Jersey Sea Grant Consortium advances knowledge and stewardship of New Jersey’s marine and coastal environment through research, education, and extension. Providing for research that results in sound scientific data used to promote wise decision-making about New Jersey’s coastal and marine resources is at the heart of NJSGC’s mission. The Education Program at the New Jersey Sea Grant Consortium holds a wide variety of programs directed towards advancing greater understanding and stewardship of our state’s marine and coastal resources. The primary goal of Extension is to provide useful information to people employed or interested in fields related to marine resources from fishermen, coastal engineers, maritime industry personnel, resource managers, and decision makers to the general public. The Communications Department provides comprehensive services to the Consortium and its project partners by using all possible means and mediums including, print, computer/web-based technology, video, radio, and broadcast television. 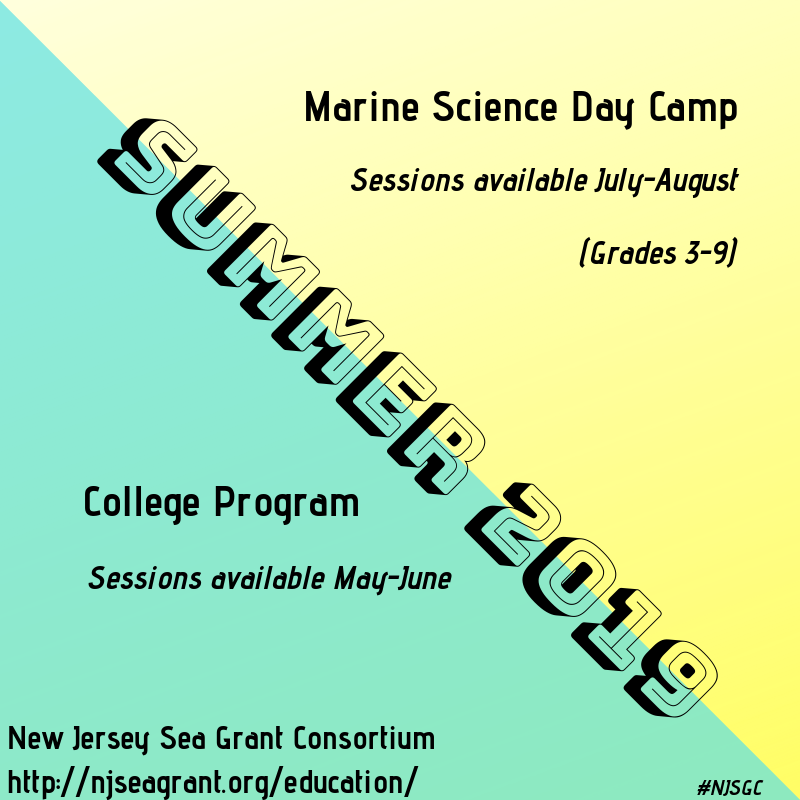 Enrollment is still open for NJSGC’s College Program and Marine Science Day Camp. Are you currently enrolled at one of NJSGC’s Member Institutions? If so, take advantage of some “beach” learning this summer! NJSGC offers sessions on Intro to Marine Science and Intro to Marine Biology which can be transferred as direct credit. For more information, please visit our College Programs website. As for those younger students interested in STEM, our marine science day camp program covers a diverse range of topics appropriate for grades 3-9. Spots are still available but do fill-up quickly, so please contact Rosemary Higgins for any further inquiries. We can’t wait to learn with you this summer at the New Jersey Sea Grant Consortium! We are delighted to announce that the next Individual Environmental Science merit badge program will be held at NJSGC on Sunday, May 5 (10:00 am – 3:00 pm) and the Individual Oceanography merit badge program on Saturday, May 11 (10:00 am– 2:00 pm). The fee is $45.00/scout for each class; adults are free. Continue reading for more information! In a fun “hands on” ocean experience at Sandy Hook, Boy Scouts can complete all badge Requirements (except #8) of the Oceanography Merit badge in one day, with the help of a NJSGC Instructor. Scouts will explore the salt marsh and discover why the ocean is important to people. Activities include measuring beach water quality, studying waves and currents, viewing worldwide sand samples under the microscope, plankton collection and identification, laboratory experiments, and seining in Sandy Hook Bay. If scouts choose to, they can complete Requirement #8 (and the badge) by writing a 500-word report about their visit to NJSGC or give a 5-minute speech about Oceanography to their troop. A pre-program activity packet is sent to each troop leader before the program. It includes a mandatory Oceanography Worksheet and directions on how to make a plankton net. The packet and plankton net MUST be completed and brought to the scheduled program. This program is conducted by NJSGC educators who are also certified merit badge counselors. The program runs approximately four hours and scouts will need transportation to the marsh site. Registration is mandatory and can be found on our website. The completed registration form goes directly to NJSGC’s Scout Program Coordinator Jody Sackett. Following registration, you will receive a confirmation along with payment instructions. Please feel free to contact Ms. Sackett at 732-872-1300 x20 with any further questions, and we look forward to seeing your scout here at NJSGC on Sandy Hook! NJSGC revamped its rip current awareness program, and we’re currently looking for more student participation. Learn how to get your local school or library involved. The 16th annual Ocean Fun Days takes place May 18-19th, so be sure to join our official Facebook event page for special highlights and updates. Former NJSGC fellow Dr. Christopher Free was recently featured in a New York Times article… continue reading to find out why! Interested in a job where you get to explore Sandy Hook while teaching children about marine science? NJSGC’s hiring part-time field instructors, with no experience necessary! 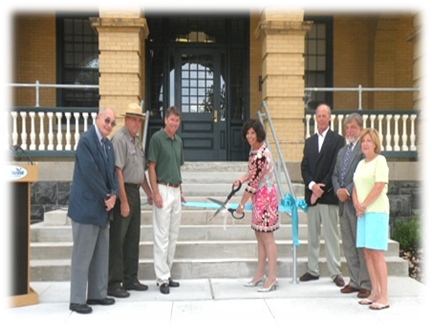 Barracks building 22 restored // Executive Director Claire Antonucci cuts the ribbon for NJSGC’s grand opening at Fort Hancock in Sandy Hook, NJ on July 12th, 2010. Plus so much more! And as always, be sure to check out what’s new and get involved by tagging us on Facebook, Instagram, and Twitter. NJSGC is currently seeking research projects to be funded for the program’s 2021-2023 Omnibus. According to Sea Grant Program Associate Diana Burich, 40 pre-proposals were recently received, each including one principal investigator (PI) and potentially one or more co-principal investigators (Co-PIs). Of those 40 submitted, 17 are new PIs applying through NJSGC. Several institutions are represented, including Drexel University, Monmouth University, Montclair State University, New Jersey Institute of Technology, Princeton University, Rowan University, Rutgers University, Stevens Institute of Technology, Stockton University, and The College of New Jersey. This year, NJSGC’s Technical Review Panel (TRP) includes 11 experts specialized in various fields. The TRP will review all pre-proposals and invite PIs to submit full proposals on April 2nd. The panel will then evaluate proposals during the summertime alongside a team of external peers, with comments provided by Stakeholder Advisory Board members and extension staff. Full proposals are due by June 17th, 2019. Awards are determined in September, with NSGO finalization and a public announcement made in October. Join NJSGC and New Jersey Natural Gas (NJNG) for our 16th annual Ocean Fun Days! This popular two-day event takes place on Saturday, May 18th at Island Beach State Park and Sunday, May 19th at Sandy Hook from 11 a.m. until 3 p.m. both days, rain or shine. FREE ADMISSION FOR ALL! Join the official FACEBOOK EVENT page for more exciting updates and behind-the-scenes info! Also please visit the OFD website for more information and directions. Enjoy hands-on marine and environmental programs and exhibits. There will be giveaways and plenty of excitement, plus fun ways to learn about our coastal environment and energy conservation for the whole family to enjoy. Learn how to use a seine net to catch native fish, crabs, and other marine creatures. Grab a fishing rod and join the youth fishing clinic. Test your boating safety knowledge or become a beachcomber and search for natural treasures on a guided tour. Hear firsthand from New Jersey scientists and researchers all about the inner-workings of the ocean and the coastline and how to protect them for generations to come. On Sunday at Sandy Hook, the NOAA Marine Fisheries Lab building will be open to the public, with many interactive exhibits as well as scientists and researchers on hand to share with you their exciting work. This only happens just once a year! Don’t miss out on these two days of Free Family Fun! Another shining moment at NJSGC! Climate change is altering habitats for marine fishes and invertebrates, but the net effect of these changes on potential food production is unknown. We used temperature-dependent population models to measure the influence of warming on the productivity of 235 populations of 124 species in 38 eco-regions. Some populations responded significantly positively and others responded significantly negatively to warming, with the direction and magnitude of the response explained by eco-region, taxonomy, life history, and exploitation history. Hindcasts indicate that the maximum sustainable yield of the evaluated populations decreased by 4.1% from 1930 to 2010, with five ego-regions experiencing losses of 15 to 35%. Outcomes of fisheries management – including long-term food provisioning – will be improved by accounting for changing productivity in a warmer ocean. Sending our congratulations from New Jersey – we’re so proud of you Chris! 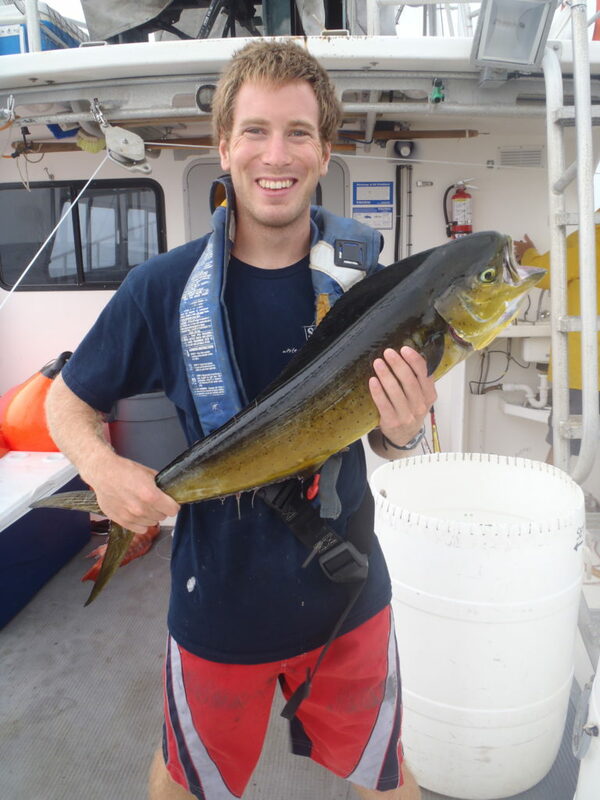 Formerly of Rutgers University, Free’s now a postdoctoral researcher with the Sustainable Fisheries Group at UC Santa Barbara.